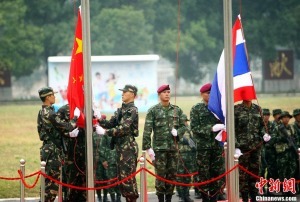 Months after the May 22, 2014 military coup that ousted the regime of Thaksin Shinawatra, the military-led government has been working in earnest to uproot the Shinawatra political machine as well as realign the Kingdom’s foreign policy to represent a better balance between China’s rising power and the West’s waning but meddlesome influence. The regime of Thaksin Shinawatra, led by nepotist proxy via his own sister, Yingluck Shinawatra, represented an inequity between this balance. Shinawatra has been a long-time family friend of the Bush political dynasty, was a member of the Carlyle Group, and since being ousted from power himself in a similar military coup in 2006, has been openly represented by some of the largest corporate lobbying firms on Earth, including, Kenneth Adelman of the Edelman PR firm (Freedom House, International Crisis Group,PNAC), James Baker of Baker Botts (CFR, Carlyle Group), Robert Blackwill (CFR) of Barbour Griffith & Rogers (BGR), Kobre & Kim, Bell Pottinger (and here) and currently Robert Amsterdam of Amsterdam & Partners (Chatham House). While in office Shinawatra took up a decided pro-West stance, economically and geopolitically. To the protest of the Royal Thai Army and the Thai people themselves, Shinawatra sent Thai troops to aid in the illegal invasion and occupation of Iraq. He also authorized the US CIA to use Thai territory to carry out their abhorrent “rendition” program. Shinawatra also attempted to ram-rod through an unpopular and quite illegal free trade agreement with America’s Fortune 500. In the wake of the May 2014 coup, anti-coup sentiment is non-existent. As predicted, there was never a significant divide in Thai society, with elections merely an exercise in handouts and vote-buying, and real support for Shinawatra being in single-digit percentiles. 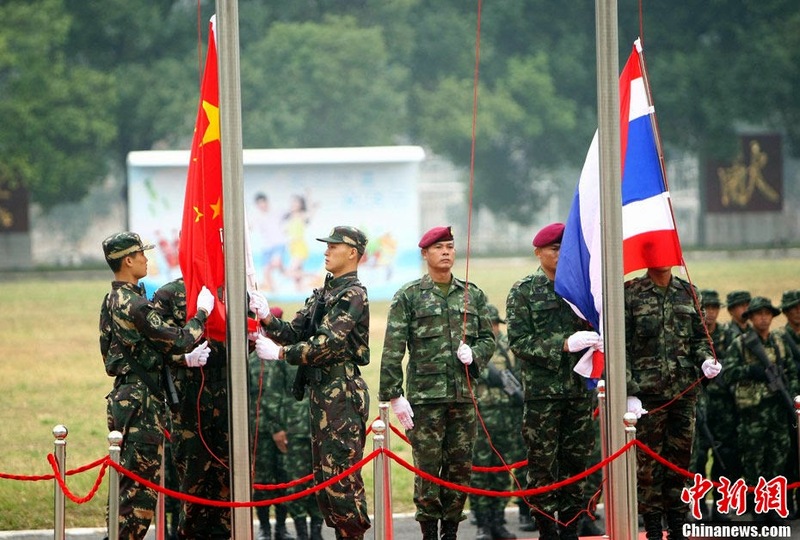 Thailand’s regional neighbor, China, is a growing power. It represents both opportunities and potential threats. Unchecked, reckless regional integration with China can lead to Beijing exercising the same unwarranted influence in Thailand that the West currently is aspiring to exert. A careful balancing act in Bangkok keeping all interests in the Pacific seeking influence within Thailand’s borders in check with one another appears to be the goal. While Washington will undoubtedly closely monitor Bangkok’s talks with Beijing, the Thai junta has clearly indicated that it has no desire for a loosening of the alliance with the US. Rather, it appears to be using the prospect of closer ties with China as a bargaining chip to strengthen the alliance. At the same time, the military is proceeding cautiously, well aware that Washington could quickly turn the regime into a pariah if it too openly embraces Beijing. Even with WSWS’ tendency to favor Shinawatra for his psuedo-populist policies while ignoring his numerous and deep ties to Wall Street, it appears that a visible break in what were previously much stronger ties with the West under Shinawatra have become obvious even to them. As noted by WSWS, General Prayuth Chan-ocha has clearly sought to strengthen ties with Beijing in a more visible and meaningful way. China immediately recognized the authority and legitimacy of the new military-led government once it took power from the floundering Shinawatra regime in May. It also welcomed the new government’s decision to move forward with a Thai-Chinese rail link long in the making. With Thailand finally re-balancing itself between East and West, China offered Bangkok the opportunity of becoming a founding-member of its Asian Infrastructure Investment Bank – part of a BRICS strategy to undermine and replace the monopoly of the IMF and World Bank dominated and driven by Western interests. Thailand has been invited by China to become one of the founding fathers of the Asian Infrastructure Investment Bank (AIIB), which is supported by this country’s central bank. “There was no reason to refuse,” Bank of Thailand Governor Prasarn Trairatvorakul said yesterday. Thailand was offered a primary signing agreement as a member from October to November, according to a report by the Fiscal Policy Office (FPO). The recent moves by the new military-led government of Thailand in relation to China have certainly given it more leverage against the West who regularly seeks to turn uncooperative nations into geopolitical pariahs. The West so far has nothing to offer Thailand in terms of incentives beyond increasingly ineffective threats and coercion. Indeed, while China offers Thailand opportunities to join alternative financial markets and strengthen regional ties, the West has resorted to a series of sociopolitical attacks aimed at undermining the credibility and stability of Thailand’s new government. The latest attempt comes in the form of baseless allegations made by a notoriously dishonest, confrontational pro-Shinawatra propagandist Kritsuda Khunasen who claims she was “tortured” by the military while recently detained. Despite all other members of Shinawatra’s regime admitting their detention by the military was humane and dignified, Khunasen claims she was beaten. With no physical evidence of any kind, the West’s human rights advocates have demanded an immediate investigation. Ironically, for 6 months prior to the coup, Shinawatra’s supporters oversaw a systematic campaign of armed violence killing over 20 and maiming hundreds in grenade and automatic weapons fire that plagued rally sites almost nightly. The same Western rights advocates calling for an investigation regarding baseless allegations of “torture” today, were utterly silent for 6 months of documented, armed violence. 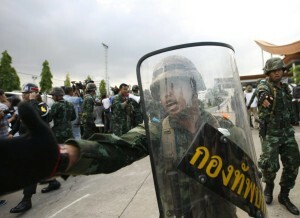 Despite this, the military-led government in Bangkok seeks to maintain what it can in regards to Western relations. The idea is to maintain a balance between competing regional superpowers Thailand has no hope of ever directly confronting itself. This strategy has served it well over the centuries, making it the only Southeast Asian nation to avoid European colonization. By pitting competing British, French, and Asian interests against one another while making small and reversible concessions, Thailand avoided direct confrontations with imperial powers that destroyed and subjugated its neighbors. But no matter how carefully Bangkok attempts to balance East versus West, one or the other will benefit more. For decades that benefactor has been the West. Today, with China offering actual opportunities for Thailand, and the West offering nothing but threats, subversion, and subjugation, it is clear in which direction Bangkok should lean further. The actions of Bangkok recently suggests such re-balancing in favor of Beijing is already taking place.